JOHOR BARU: Senibong Cove, a waterfront housing project here with an estimated gross development value (GDV) of RM1.7bil, is scheduled to be completed in two years. The development is a joint venture between Iskandar Waterfront Development Sdn Bhd and Australia’s Walker Group. “Walker Group is one of the leading developers in Australia and the whole residency is similar to the housing project in Hope Island, Australia,” said Quay Chew Keong, the project’s director. “The whole residency will have four different parks and all the houses will have gardens or a view of the water. “We have not started officially advertising for buyers as yet but 90 (people) have already registered for the houses,” he added. The project, located in Mukim Plentong, features cluster houses, semi-detached houses, bungalows, apartments, luxurious apartments and terrace houses, with prices ranging from RM290,000 to RM1.8mil each. “Other than that, residents would also be able to enjoy the facilities of a marina with 70 to 100 berths,” Quay said. 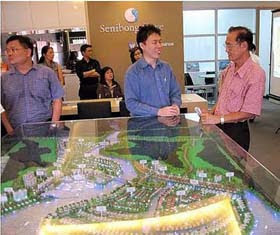 He added that the project was located directly opposite the Sembawang Shipyard. Johor Mentri Besar Datuk Abdul Ghani Othman will formally launch the project early next year. DUBAI: The soon-to-be-opened Burj Dubai is entering the record book as the world’s tallest building and sharing this honour, is Malaysian structural steel construction firm, Eversendai Corp. According to group managing director Datuk A.K. Nathan, the final 260m of the soaring tower was an all-steel structure, and Eversendai had the privilege of putting it up successfully. “In fact, we’re the first company in the world to have worked above 700m. No one in the world has worked above this height,” he told Bernama in Dubai. 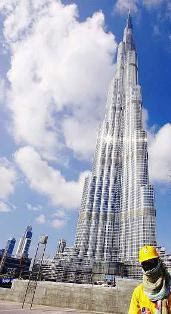 Previous reports have mentioned that Burj Dubai is over 800m tall with more than 160 floors. Its developer Emaar Properties is keeping mum about the actual height of the gleaming tower, amid statements that its spire can be seen 95km away. Burj Dubai is to be inaugurated on Jan 4, 2010 by United Arab Emirates (UAE) vice-president and prime minister, and ruler of Dubai, Sheikh Mohammed Bin Rashid Al Maktoum. Nathan said Eversendai also carried out structural steelworks on other parts of Burj Dubai. Alluding to the last 260m of the super-tall building, Nathan said it was a highly complex structure needing precise design, fabrication and contruction processes. “And we’ve done everything to the full satisfaction of our client without any kind of accident,” he said. He also said Eversendai had good working relations with the tower’s main contractor, Samsung Corp of South Korea. Then came a slew of other projects in the UAE, Qatar and other places worth billions of ringgit for Eversendai. Qatar is a particularly bright spot for Eversendai, which is currently involved in projects such as the new Doha international airport and the Dubai Towers-Doha. Nathan reckoned that it had not been easy for Eversendai to be where it was now. “A company that wants to venture overseas must have developed its own capability as well as possessed a measure of financial strength. “If you don’t have these, it’s very difficult to penetrate thte overseas markets. I mean, asking support from the government is one thing. But the government also has its limitations,” he observed. LII Hen Industries Bhd’s subsidiary, plans to buy three plots of land with buildings in Muar, Johor, for RM2.2 million. Kejora Juara Sdn Bhd, the group’s property investment arm, has entered into an agreement with Paragon Progress Sdn Bhd, to acquire the properties to house a majority of the group’s foreign workers. The properties, which are located about 500 metres away from the group’s major plants, are expected to offer more easy management. The group will fund the acquisition through internally generated funds. PETALING JAYA: Crest Builder Holdings Bhd has been awarded a contract valued at RM175.5mil by SP Setia Bhd for the construction of “superstructure” works of two 40-storey serviced apartments along Jalan Tun Razak and Jalan Raja Muda Abdul Aziz in Kuala Lumpur. The company said in a filing with Bursa Malaysia yesterday that the project was expected to be completed in 24 months from date of site possession on Jan 2, 2010. KUWAIT: Kuwait Finance House (KFH), the country’s biggest Islamic lender, said it signed a US$242 million (US$1 = RM3.42) real estate deal in Chicago. KFH owns 95 per cent of the project, the remaining 5 per cent is owned by Prism Co.
“KFH will focus on income producing assets with attractive yields and guaranteed occupancy levels,” it said. In August, the lender said it was tying up with US apartment building owner UDR Inc to buy high income property in the US. The joint venture seeks to acquire investments of up to US$450 million in major cities in the US.